Creamy Tomato Soup with Croutons is one of the daily soup offerings at Panera Bread. The soup features pear tomatoes blended with cream that provides the creamy texture. It is sold in a 12-oz. bowl. A bowl of the Creamy Tomato Soup with Croutons has 370 calories. More than half -- 200 -- come from fat. If you eat 2,000 calories each day, a bowl of this soup represents 18.5 percent of your total daily calories. 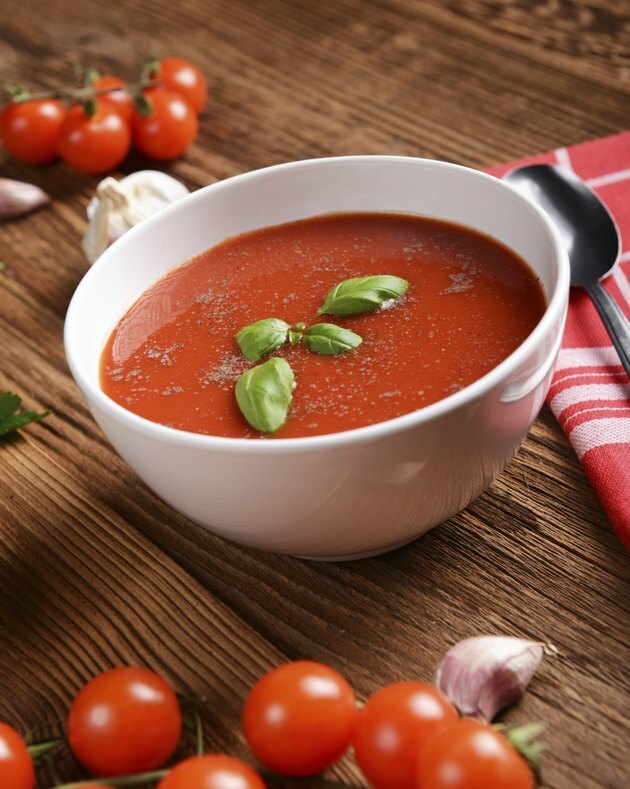 A bowl of the tomato soup has 23 g of total fat. That fat includes 12 g of saturated fat and 1 g of trans fat. It also contains 15 mg of cholesterol. Soups have a reputation for being loaded with sodium. In the case of Panera's Tomato Soup with Croutons, each bowl contains 740 mg, which amounts to 30.8 percent of the maximum recommended intake. The U.S. Department of Agriculture advises that people limit sodium intake to no more than 2,400 mg daily to prevent high blood pressure. The tomato soup contains 39 g of total carbohydrates. The breakdown includes 13 g of sugars as well as 5 g of dietary fiber, Panera reports. The creamy tomato soup does not provide a good source of protein, but each bowl of the soup does have 4 g of the nutrient. Panera's tomato soup also contains several essential vitamins and minerals. A 12-oz. bowl has 20 percent of the recommended daily intake for calcium; 10 percent of the recommended daily intake for vitamin A; 8 percent of the recommended daily intake for iron; and 4 percent of the recommended daily intake for vitamin D.